eEuroparts.com® carries an extensive catalog of aftermarket, OEM, original, and genuine parts from over 200 manufacturers. We are also constantly updating our Genuine Mercedes parts selection to give you the best possible selection of parts. Founded by automotive giants Gottlieb Daimler, Karl Benz, and Wilhelm Maybach, Mercedes Benz has long been regarded as the world's oldest and best recognized automobile manufacturer. The auspicious three pointed star symbolizing dominance over land, sea and air was a portent of Mercedes Benz's sweeping success as an automotive manufacturer. A pioneer of safety and performance features, Mercedes Benz introduced direct gas injection in the 1954 300sl, first produced crumple zones in 1959, anti-lock brakes in the w116 6.9 and incorporated airbags into production w126 sedans in 1979. With the introduction of the 560SEL, 560SL and 560SEC in 1985 and subsequent release of the ultra-luxurious w140 s500 and s600 sedans and coupes Mercedes Benz secured itself as an immutable member of the German big three and an apex luxury manufacturer. When you buy Genuine Mercedes Benz parts you're buying and replacing the parts on your vehicle with a part of the exact same quality, fit, and finish of the original. Genuine Mercedes Benz sets the standard for your vehicle. Also look for Genuine Mercedes Benz parts built by our expansive list of OEM and OES suppliers including: Bosch, Sachs, INA, FAG, Luk, MANN-HUMMEL, Mahle, NGK, and nearly 50 other OEM suppliers in our catalog. 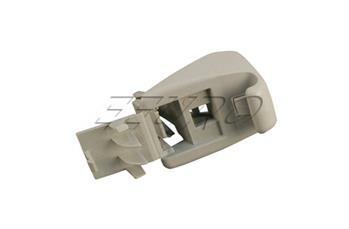 If this is not the exact Sun Visor Clip (Gray) you are looking for, or you would like this part in a brand other than Genuine Mercedes, please contact us and one of our customer service experts will help you locate the exact part you need. eEuroparts.com® proudly offers wholesale prices and fast shipping available on most orders. We also provide inexpensive and guaranteed 3 day, 2 day, and Overnight shipping options, so if you need your Sun Visor Clip (Gray) tomorrow, eEuroparts.com® can deliver! Every eEuroparts.com® order is track-able, meaning you'll know exactly where your Sun Visor Clip (Gray) is at every step of the shipping process. eEuroparts.com® also displays your Expected Ship Date and transit time in your Cart, making our entire shipping process simple and transparent.